Pitbulls get a bad rap. You know that better than anyone. Just because other people are ignorant of your loving Pitbull pup doesn't mean they don't deserve nice things. We've taken into account the unique characteristics of Pitbulls including their energy and protein requirements to come up with recommendations you'll be proud to serve your dog. Once you try one out we'd love to know how it goes. Let us know in the comments! It is sad but true that Pitbulls have a reputation for being aggressive and dangerous dogs. What any Pitbull owner will tell you is that these are some of the friendliest, most gentle dogs you will ever encounter. The name Pitbull doesn’t apply to a specific breed but rather to a group of breeds and mixed breeds including the American Staffordshire Terrier, American Bully Staffordshire Bull Terrier, Staffordshire Bull Terrier, and the American Pitbull Terrier. The breed that is most commonly known by the name Pitbull is the American Pitbull Terrier, a medium-sized dog that stands up to 21 inches tall, weighs up to 60 pounds, and has a lean, muscular body type. Though these dogs may look intimidating to some, they are extremely affectionate and loving dogs with a gentle, patient demeanor when they are properly trained and loved by their owner. Dealing with the breed’s negative reputation is just one of the challenges that Pitbull owners face – you also have to choose the right dog food to provide your Pitbull with the right blend of nutrients to maintain lean muscle mass and healthy energy without going overboard on calories. Keep reading to learn more about the nutritional needs of Pitbulls and to receive recommendations for dog food brands. The American Pitbull Terrier is a medium-sized breed that generally weighs 30 to 60 pounds at maturity. Though these may not be some of the largest dogs out there, they are definitely one of the most muscular. When properly fed, an American Pitbull Terrier will have strong, well-defined muscles on his legs, back, shoulders, and neck – this is part of what contributes to their intimidating image. As strong and powerful as the Pitbull is, he is just as capable of being gentle and loving as any companion breed. Because these dogs have so much muscle, however, his nutritional needs are a little bit different than the average adult dog’s. All dogs require a balance of protein, fat, and carbohydrate in their diet. As puppies, American Pit Bull Terriers require a lot of calories to fuel their metabolism so they can grow quickly – they also need a lot of protein to build strong muscles and healthy tissues. This is true of all puppies but, more so than some other breeds, the American Pitbull Terrier continues to have very high needs for protein as an adult. A dog food formula with a high protein content will help your adult dog to maintain his lean muscle mass which is essential for a healthy bodyweight. American Pitbull Terriers tend to be very active dogs so they are a little less likely to become obese than some breeds, but they still need plenty of daily exercise and a diet rich in protein. When it comes to fat in your Pitbull’s diet, it is a fine line to walk between too little and too much. All dogs need some healthy fats in their diet because fat is the most highly-concentrated source of energy available to dogs. Muscular and active breeds like the American Pitbull Terrier have fast metabolisms that burn through calories very quickly, so your dog may need a diet higher in fat than other dogs of similar size. It is important to remember, however, that the fats in your Pitbull’s diet need to come from high-quality, animal-based sources like chicken fat and salmon oil. Your dog should get a balance of omega-3 and omega-6 fatty acids as well to support his skin and coat health as well as the health of his immune system and brain. In terms of calorie needs, no two Pitbulls will be exactly alike. For the most part, dogs require about 30 calories per pound of bodyweight each day. For a Pitbull, that means a range of about 900 to 1,800 calories daily. If you consider the fact that Pitbulls have a lot of lean muscle mass to maintain and the fact that they are generally an active breed, you might expect a higher daily calorie requirement closer to 35 or 40 calories per pound of bodyweight. That could put your Pitbull’s daily needs in the range of 1,050 to 2,400. It can be difficult to pinpoint your dog’s exact calorie needs, but if you speak to your vet he should be able to give you some tips for how much to feed your Pitbull. To make sure that your Pitbull gets the right combination of nutrients, you might want to consider feeding him an active or working breed formula or a medium-sized breed recipe, if you can find one. No matter what kind of recipe you choose, you must make sure that it is made with high-quality ingredients in a complete and balanced formula. Any product you choose for your Pitbull should start with an animal-based protein like poultry, meat, or fish as the first ingredient – if the product lists a carbohydrate first, it is not going to meet your dog’s needs. In addition to plenty of animal protein, a quality diet for a Pitbull will also be rich in animal fats. In terms of carbohydrates, some Pitbulls can tolerate grains and some can’t. 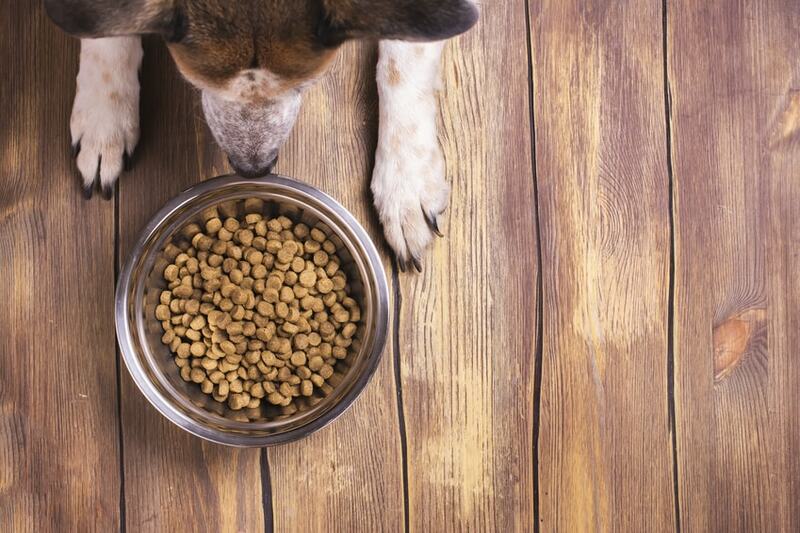 For some dogs, a formula made with whole grains may be a good choice, or you may want to try a grain-free recipe made with green peas, sweet potatoes, or legumes. In any case, the carbohydrates should be highly digestible and the dietary fiber content of the recipe should be limited to no more than 5%. As a puppy, your American Pitbull Terrier’s nutritional needs will be a little different than his needs as an adult. Puppies need a diet that consists of at least 22% protein and 8% fat while adult dogs need at least 18% protein and 5% fat. You must remember, however, that the Pitbull’s needs for protein and energy (fat) are a little higher than for most breeds. So, when you are ready to switch your Pitbull from a puppy recipe to an adult recipe, try to find an adult formula that has a similar nutritional composition to the puppy formula. Active and working breed formulas are usually higher in protein and fat than traditional adult recipes, so that might be a good choice for your dog. If your Pitbull is not particularly active, a medium-breed or regular adult dog recipe might be perfectly fine as long as there is plenty of animal-based protein in it. The amount of food you feed your Pitbull will vary according to a number of factors. For one thing, puppies need to eat more frequently than adult dogs to sustain their growth and development. Many Pitbull owners allow their puppies to feed freely to ensure that their needs are met. As your Pitbull puppy transitions into an adult, you may want to cut back his daily feeding to two or three meals, depending on his activity level. Different dog food recipes have different calorie contents, so it is generally a good idea to follow the feeding recommendations on the pet food package. The package will tell you how much to feed your Pitbull according to his weight. Follow these instructions for a few weeks while monitoring your dog’s bodyweight and condition – if he gains or loses too much weight, you may need to make an adjustment. If you aren’t particularly concerned about feeding your Pitbull an active breed formula, you may want to consider a high-protein adult dog recipe like those included in the Blue Buffalo Wilderness line of products. Blue Buffalo is one of the biggest names in the pet food industry, known as much for the quality of their products as for their variety. Blue Buffalo offers four unique product lines, as well as a line of veterinary diets, for dogs in different life stages and with different nutritional needs. The Wilderness line of products is designed to provide protein-rich, grain-free nutrition in recipes that are inspired by the natural evolutionary diet of wild wolves. Choose from recipes formulated specifically for puppies, adult dogs, or senior dogs in an assortment of dry foods, wet foods, and meat-rich rolls. Many of the recipes in the Blue Buffalo Wilderness line of pet foods are made with novel protein sources like bison, venison, rabbit, and salmon with grain-free carbohydrates like tapioca starch, peas, and potatoes. All of Blue Buffalo’s recipes also include their LifeSource Bits, a proprietary blend of vitamins, minerals, and antioxidants to ensure optimal health and balanced nutrition. The Dr. Tim’s brand of dog food features all-natural, premium recipes made with only the best ingredients. This brand is uniquely designed for active and working breeds like the Pitbull, offering an assortment of complete and wholesome meals. Dr. Tim’s dog food makes use of premium animal proteins with the right blend of healthy fats, fibers, and carbohydrates to ensure that your dog leads a long and healthy life. Dr. Tim himself is a licensed veterinarian, so he understands the nutritional needs of dogs and formulates all of his recipes in accordance with those needs. Not only are Dr. Tim’s formulas complete and balanced, but they are loaded with natural flavor. The Active Dog Formula in particular is a great choice for Pitbulls because it is rich in animal protein and healthy fats and it contains a unique fiber blend to support your dog’s healthy digestion. This formula is metabolically balanced to meet your dog’s energy needs while also being high in antioxidants to fuel his recovery. This recipe is designed for dogs with a moderate to energetic activity level – there is also a highly active and an ultra-athletic formula available. The NutriSource brand is known for producing premium pet foods made with high-quality, natural ingredients. NutriSource is a family-owned and -operated company that has been making premium pet food products for more than 50 years. This company understands that a quality diet is the key to a long and healthy life, so they make an effort to ensure unbeatable quality and safety with each of their products. NutriSource offers an assortment of original and grain-free dry foods for dogs in all life stages, including a Performance and a Super Performance recipe. The NutriSource Performance Chicken & Rice Formula is specifically designed for working breeds as well as pregnant or nursing females and dogs who need to gain weight. It features real chicken as the main ingredient to maintain muscle mass and strength, plus healthy fats like fish meal, chicken fat, and flaxseeds for concentrated energy and omega fatty acids. This formula contains 30% crude protein and 20% crude fat with just 5% crude fiber. The Super Performance recipe also features chicken as the main ingredient with carbohydrate support from brown rice, oatmeal, and flaxseed. This recipe contains 32% crude protein, 21% crude fat, and 5% fiber. If you want the best for your Pitbull but you don’t necessarily want to go with an active breed formula, an adult recipe from Solid Gold would be a great choice. Solid Gold is an all-natural brand of premium pet foods that are formulated in keeping with a holistic approach to pet nutrition. Every one of Solid Gold’s products is designed not just to meet, but to exceed your dog’s nutritional requirements in the healthiest and most flavorful way possible. Solid Gold offers an assortment of protein-rich recipes for active adults age 1 through 7 years as well as puppy-specific recipes. The Solid Gold Wild Heart recipe with quail is particularly good for medium- to large-breed dogs like the Pitbull and it has the added bonus of being gluten- and grain-free. This recipe features quail as the primary protein with chickpeas, peas, and potatoes for carbohydrate support. This Solid Gold Wild Heart with Quail Formula contains 27% crude protein, 14% crude fat, and 4% crude fiber. The Victor brand of dog food has been producing high-quality, all-natural pet foods for more than sixty years and consistently receives high ratings from pet food review companies. This brand develops all of their own recipes using the latest advancements in canine nutrition to ensure premium quality as well as complete and balanced nutrition. Victor offers a fairly limited selection of pet food products, but you can count on the fact that each and every one offers unsurpassed quality. There are three lines of Victor dog food – Victor, Victor Select, and Victor Grain-Free. The Active Dog and Puppy formula belongs to the grain-free line of products and it features beef meal, chicken meal, pork meal, and menhaden fish meal as the primary sources of protein. As a grain-free recipe, this formula features digestible carbohydrates like sweet potato, peas, and flaxseed. If your Pitbull doesn’t have a grain allergy or sensitivity, there is also an active puppy and dog formula in the Victor Select line of products. The Victor Select Nutra Pro recipe is high in protein and low in carbohydrates for dogs with moderate to high activity levels. The Pitbull is a wonderful breed, but these dogs can sometimes be a challenge to train and keep. If you are up to the challenge, however, you will find that your Pitbull becomes a loyal friend and companion who will never leave your side. As such, your Pitbull deserves the best diet you can give him – any of the recipes reviewed above would be a great choice.